The daughter of two black nationalist radicals, Kenya grows up in West Philadelphia in the late 1980s feeling different than the other kids in her African American community. In Kenya’s family there is no TV, no saying the Pledge of Allegiance during school, and no Christmas—Kwanzaa is celebrated instead. But her parents’ love and their ideal community, called the “Seven Days,” only lasts for so long, and eventually Kenya and her mom are on their own, living in the suburbs, where Kenya faces new challenges when she one of a few girls of color at a private girls school. Disgruntled chronicles Kenya’s coming of age as she tries to make sense of the world, both in West Philadelphia and later in the suburbs. I don’t want to give away too much of the story as it was fun to watch this book unfold, but it twists and turns as Kenya grows up, ending just after she graduates high school, with the dream of going off to college. As she grows up, her father does things she can’t believe he is capable of. And she surprises herself as well, including a sleepwalking incident. Solomon is a graceful writer. She creates a beautiful portrait of Kenya—a girl who is shut out of her parents’ adult world, while being asked to follow their rules at the same time. I felt close to Kenya as she negotiated the challenges in her life. This is a unique coming of age story of a young black woman. Solomon is a professor at Haverford College. She has also published a collection of short stories called, Get Down. Disgruntled was widely reviewed when it came out, but I feel like it has not gotten as much attention as it deserves. Thanks to Proto Libro reader, Kate M for telling me about this book! When I first started this blog, I looked to the Guardian First Book Award list for books to read and write about. Like the Center for Fiction First Novel prize list, this award often singles out books that I have really enjoyed and notices books off the beaten path, widening the readership of an array of new authors. I continue to value their choices. This year’s long list is out and it includes a quirky Irish novel that was nominated by their readers: Sara Baume’s, Spill Simmer Falter Wither, which is about the relationship between an older man and his rescue dog. The book was published by a small press in Ireland. I find it remarkable, and exciting, that this book has developed such a following that enough readers voted for it, and wonder if a title published by a small press in the US could build a similarly enthusiastic popular following. The long list contains a combination of first novels, a short story collection and books of non-fiction, with many titles being published by small presses. It includes, Nell Zink, who is getting a lot of press for her debut, The Wallcreeper, and Chigozie Obioma whose book, The Fishermen, has also been nominated for a Booker Prize. Check out the list…which books stand out to you? 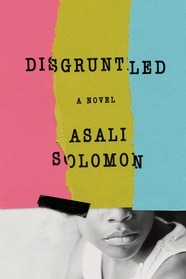 Next up I review Disgruntled by Asali Solomon. The Somner family has seen brighter days. Cecilia, “CeCe” the matriarch, an heiress to a family fortune, has a degenerative disease and decamps to a rehab facility for experimental treatment, hoping to bring back her life as she once knew it. George, her son, dreams of having his opera, The Burning Papers, produced at any cost. And Iris, George’s wife, struggles to hold herself, and her marriage, together as George pursues his creative dream. Told in alternating voices, The Unfortunates tells the stories of these three characters over the course of one year. This is sumptuous read. McManus has a beautiful use of language and the stories slowly unfold on the page, reminding me of novels from the late 19th and early 20th centuries. George is a tragic character, wealthy and in need of nothing material, yet restless and unsatisfied with life. CeCe is a demanding mother overly concerned with appearances and material items. Iris marries into the family, and their wealth, and is more comfortable with Victor, a man they hire as a personal trainer and dog walker, than she is with CeCe. This is a book about family, wealth and ambition and what it means to come from a family of influence that has a name that is recognized and needs to be protected. It is also a story of denial and isolation and the extent to which we all live in our own bubbles. I enjoyed this book for its beautiful, meticulous, language and for the characters, who were relatable to me. 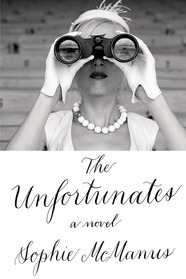 The Unfortunates is a perfect summer read, to be slowly enjoyed on a hot summer afternoon. And the story culminates with some interesting twists and turns, which I will not reveal. McManus lives in Brooklyn. The book has been mentioned on summer book lists and was long listed for the Center for Fiction First Novel Prize for 2015. This book’s cover is my favorite of the year!